Bitcoin mining in 2018 hasn’t been as profitable as in 2017 despite an increase in overall revenue. 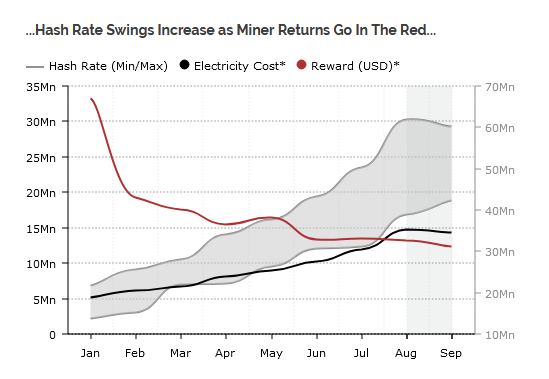 With the network hashrate continuing to increase astronomically, miners now pay higher electricity tariffs severely affecting their bottom-lines. According to Diar, revenue accrued by BTC miners for the first half of 2018 exceeded the total revenue earned for all the whole of 2017. Adding the figures from Q3 2018, BTC mining revenue for the year now exceeds 2017’s numbers by more than $1.4 billion. 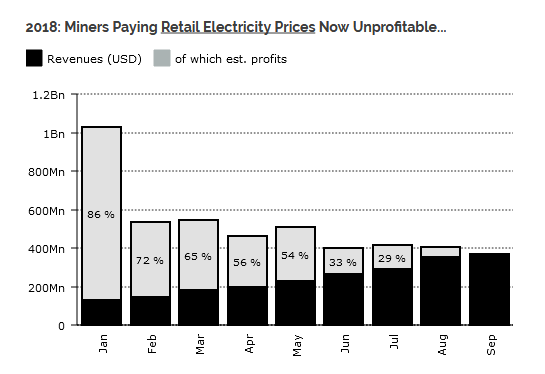 Despite these impressive revenue earnings, mining profitability has taken an enormous hit. Since the start of the year, miners have earned successively lower profits culminating in zero profit for September 2018. Within the backdrop of this mixed bag of fortune is the massive decline in BTC price since the start of the year. Bitcoin is down more than 60 percent, with contracting volatility and low liquidity level. 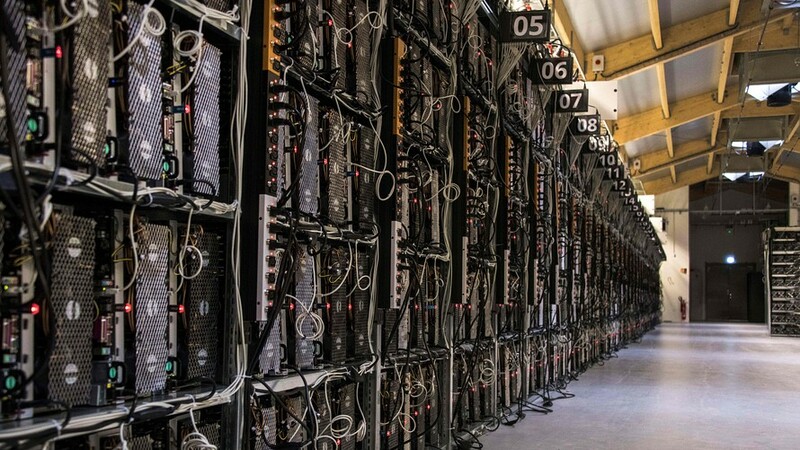 Thus, it is perhaps unsurprising to see mining profitability starting to shows signs of decline mirroring the ongoing trend in the wider cryptocurrency market. One major contributing factor to the declining BTC mining profitability is the skyrocketing network hashrate. In mid-September, Ethereum World News reported that the Bitcoin network hashrate had doubled to since May 2018 from 28 quadrillion hashes per second to more than 57 quadrillion hashes per second. At the time, Sam Doctor of Fundstrat Global Advisors estimated BTC mining breakeven cost at $7,300. According to Doctor, this new figure represented a $1,300 increase in breakeven cost since May 2018. However, towards the end of September, there seems to be an emerging tapering of the network hashrate climb. This slight pullback might be due to smaller miners pulling out and the larger companies not yet taking advantage of the hashrate deficit. Already, cloud mining platform ‘HashFlare’ announced the termination of its Bitcoin mining contract. The service cited declining profitability as the reason for its decision. Genesis Mining also ended its lower-tier BTC mining contract for similar reasons to the one provided by HashFlare. Unlike its competitor though, Genesis advised its customers to upgrade to a premium package. While the smaller players tap out, behemoths like Bitmain continue to eye continuous expansion, consolidating their monopoly of the BTC mining arena. There are still 54,000 BTC available for mining per month. Miners still earn fees from their activities on top of the base block reward. If anything, there is still space for more expansion in the mining industry as the smaller miners leave the scene for mining giants with significantly larger resources at their disposal. Cover image courtesy of MarketWatch.